The now-former Police Commissioner of the Baltimore City Police Department, Anthony W. Batts, vowed that Henderson’s death, as well as another victim’s would be fully investigated. “I will not slow down. I will not allow us to not stay on top of these. We will push extremely hard,” he said at the time. A suspect, Shawn Oliver, 46, was acquitted of all charges on Jan. 12, 2017 in Henderson’s death. Oliver was arrested in August 2015 after police discovered DNA evidence on Henderson’s fingernails that matched Oliver. He had been charged with first-degree murder as well as second-degree murder and first-degree assault. Bullock told LA Times Sport Writer Arash Markazi that his sister never got to see him play college basketball at North Carolina. Bullock didn’t know what his teammates and other people would think and she didn’t want to make things uncomfortable for him. It was a situation he regrets to this day. The loss of his sister set Bullock on a path to not only advocate and defend LGBT rights but also educate others about the day-to-day realities, especially for trans women of color and the dangers they face. Two years ago, the media network Mic initiated a project called “Unerased: Counting Transgender Lives” which revealed the sobering statistic that that one in 2,600 transgender women of color between 14 and 34 years old is a homicide victim compared to one in 12,000 in the general population. 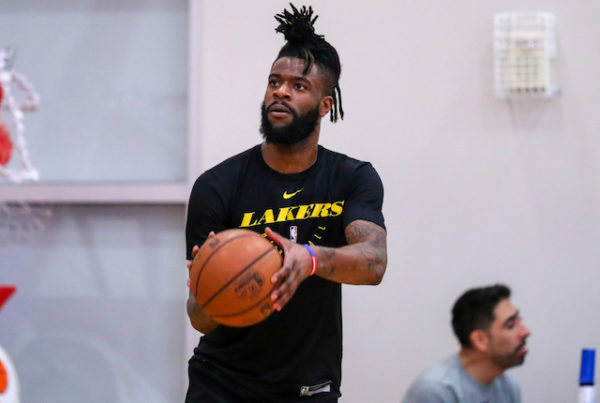 These days, when he is not on a basketball court either in game-play or practice, Bullock lends his name and his status to the cause of equality as an NBA player. Last month, Bullock sat down to speak about his activism with Advocates for Youth’s YouTube series ‘Kikis With Louie’ host Louie Ortiz-Fonseca. Bullock has a tattoo of his sister’s name over a rainbow heart with “LGBTQ” written at the top on his left leg. As he related to Ortiz-Fonseca, that tattoo became a teachable moment as he educated himself on trans issues. Shortly after Henderson’s death, he got a tattoo in her honor, but used the name his sister had used prior to her transition. It wasn’t until after the tattoo had been completed, he said, that he understood he’d made a grievous error. “I wasn’t educated enough ― that’s pretty much dead-naming her,” Bullock said, noting that he rectified the mistake with a second tattoo. On the court he wears sneakers with “Equality” written all over them and with his sister’s name etched on the sole. He has spoken about his desire to have the NBA to adopt rainbow-colored uniforms, even for just one game, as a way to recognize the LGBTQ community. Bullock, who was at the time playing for the Detroit Pistons, was the first active player to ride on the NBA Pride’s float during last year’s New York City Pride March. He rode on the float to honor the life of his sister. The LA Lakers are scheduled to play the LA Clippers on Monday, March 4 at the Staples Center. Reporting by the staff of the Los Angeles Blade with Vice Sports, The Los Angeles Times, WBAL-11 CBS for Baltimore, Mic Media, and the Washington Blade.